Radiation from very hot objects like the sun is mostly in the form of light and short wavelength radiation. This type can pass through glass. Radiation from less hot objects like fire and heat radiated from hot bodies is largely long wavelength radiation. This type cannot pass through glass. 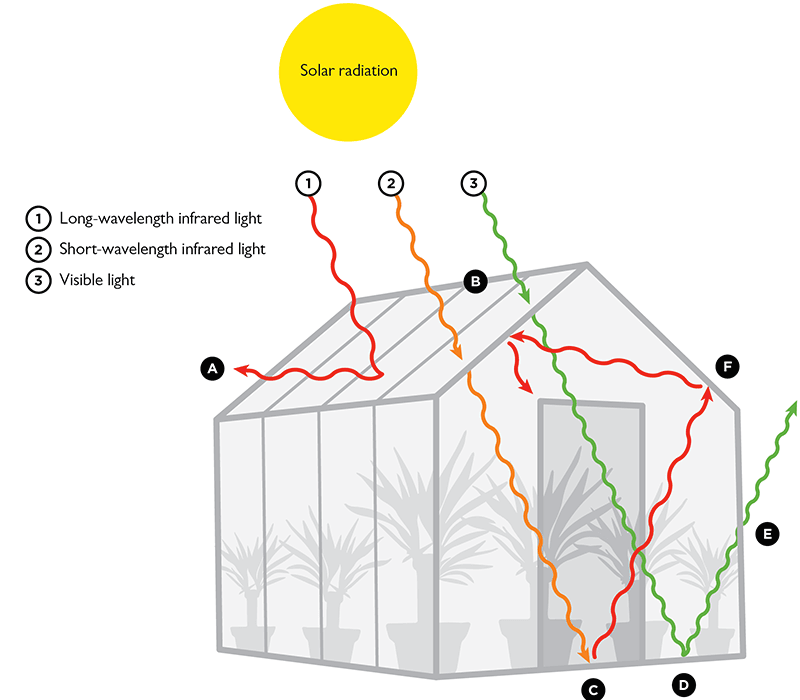 Light and short-wavelength infrared rays from the sun penetrate a glass house and are absorbed by soil and plants. Their temperature rises. Soil and plants emit the heat (infrared radiation) but because of its relatively low temperature and long wavelength, it is not transmitted through the glass. The heat is reflected back into the house. This causes more heat to be absorbed by the plants raising the temperature some more. Greenhouse gases such as carbon dioxide (CO2) work just like the glass panels of the greenhouse. They allow radiant heat in from the sun but trap the heat that is emitted from the earth and other hot bodies. The more CO2 and other greenhouse gases that are in the atmosphere the more heat is trapped within the earth’s atmosphere. Infrared rays from the sun (which is short wavelength radiation) penetrate the earth’s atmosphere and are absorbed by the earth itself, people, plants and animals. Emitted radiation from the hot planet and other hot bodies (which is long wavelength radiation) radiates into the atmosphere. The presence of greenhouse gases such as CO2 prevents the heat from escaping the atmosphere and re-emits it back onto the earth. It causes a rise in the temperature. The presence of CO2 and other greenhouse gases is increased by activities such as burning fires. It also comes from fuel emissions from vehicles and generators and from CFCs found in tin can products.